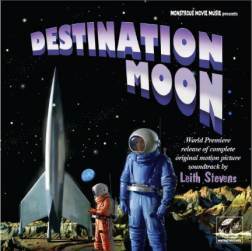 Destination Moon (MMM-1967) is the first complete release of Leith Stevens’ classic 1950 soundtrack. Simply one of the greatest outer space scores, these original soundtrack recordings have never been released on CD. The spectacular score totals over 56 minutes, a half-hour more than was released on ten-inch album over 60 years ago! From the composer’s original acetate recordings, this archival CD includes every drop of Stevens music, including some that was edited from the movie. The disc also contains Clarence Wheeler’s fantastic accompaniment written for the Woody Woodpecker cartoon that’s shown in the George Pal motion picture. This most important science fiction score is finally available so film music fans can revel in its brilliance. This Monstrous Movie Music release contains a 20-page liner book discussing all aspects of the music, as well as containing copies of some of the written scores. Stunning cover painting by Hugo Award-winning artist Vincent Di Fate.